Day 4 on the trek and the routine was setting in! The day began at 6:00 with a combination wake-up/breakfast tea at my tent door, followed a few minutes later by some warm water in a wash bowl. Meanwhile, I was stuffing everything back into the agency-supplied duffel bag. The very bulky goose down jacket and sleeping bag were making the process a bit of a pain! Then it was off to the dining tent for breakfast, which consisted of porridge and other cereals, toast with peanut butter and assorted jams, and for the non-vegetarians – i.e. everyone but me! – the occasional egg. Coffee, tea, and juice were served and water bottles were filled up for the morning’s walk. Given the importance of staying well- hydrated at altitude, especially if you are taking Diamox for acclimatization, the cook team kept the liquids coming at each meal. All of us were making use of the drug as a prophylaxis except for Rob, who had just done the Everest Base Camp trek and was already well-acclimatized. By the time we left around 7:45 the tents were already down and the duffels had been bundled and assigned to the various porters. The government-set maximum load for a porter is a whopping 30 kilograms although I think some of our guys were carrying somewhat more. 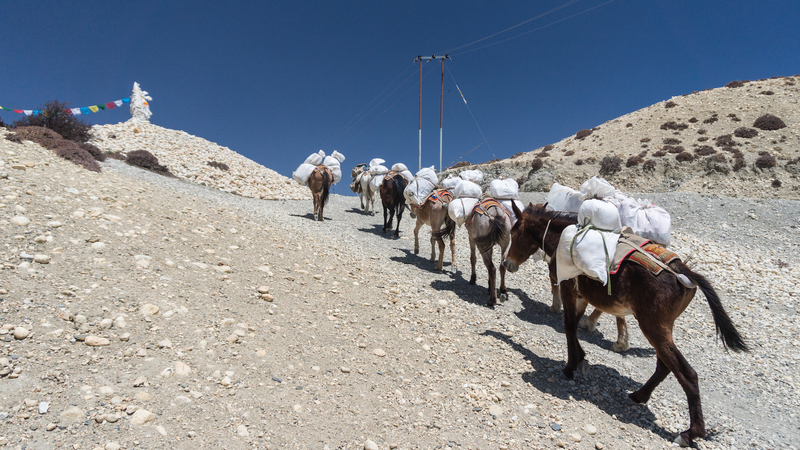 I never did pick up one of the porters’ load to see what it felt like. 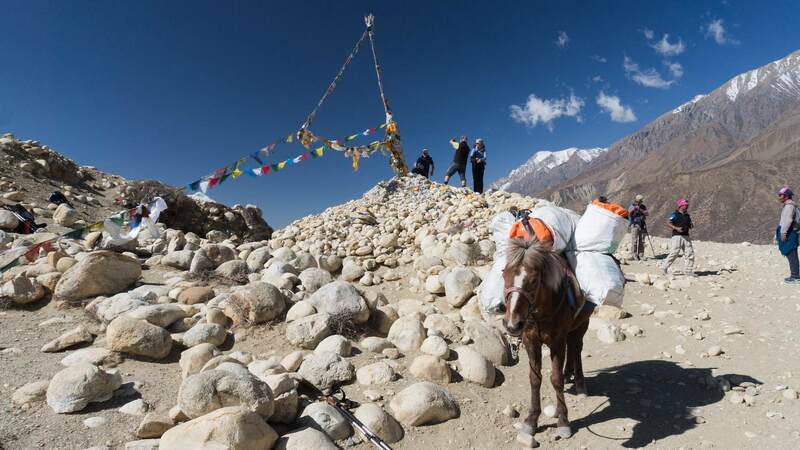 Even if I had, carrying it for a few minutes would hardly come close to the six hours the porters put in. Today the porters got a break. 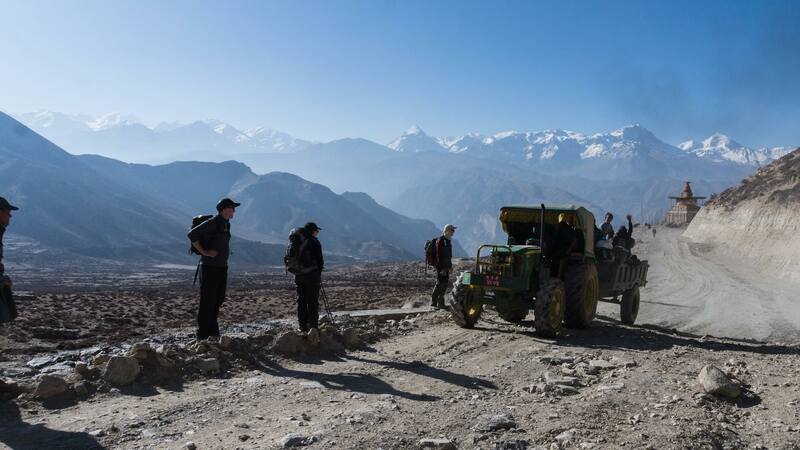 Arrangements were made with the Tamagaon guesthouse owner for a tractor ride all the way to Tsarang, our destination. 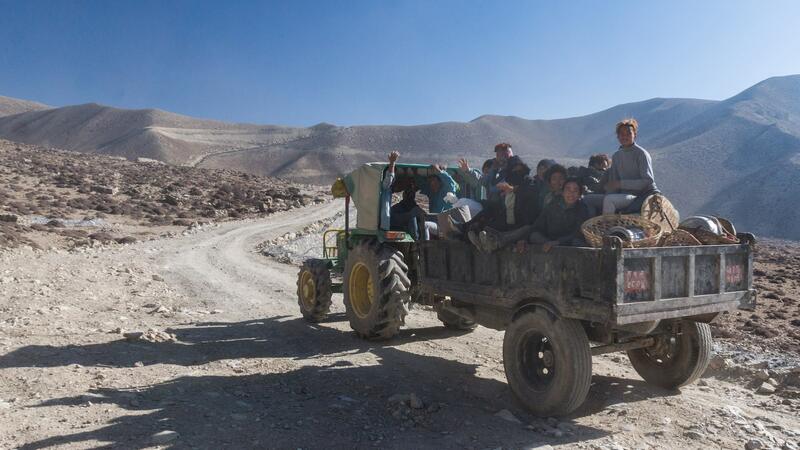 The next two images show our ten porters and their loads in the back. They look very happy! They would also get the next day off as we spent two nights in Charang before moving on. That’s when the real work would begin! The road they took was essentially the one we walked except for some switchbacks that the trekkers’ trail was able to eliminate. The road was “Nepali flat” from Tamagaon all the way to Zaite, after which there was some steeper uphill as we approached our first pass of the day – Nyi La (4010m). We got some great views from the top looking back to Zaite and Tamagaon and were even able to see Ghiling to the east. Just behind us was a group of four Italian trekkers with their mandatory guide, as well as a donkey carrying a full load of their gear. 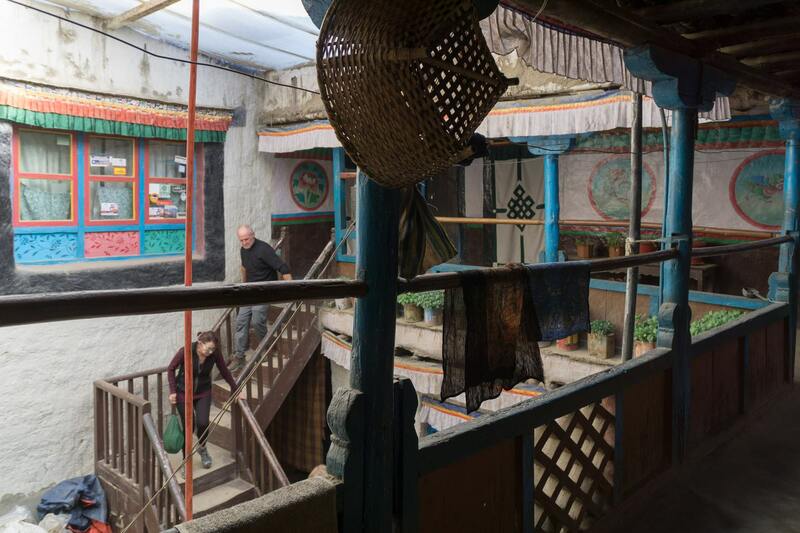 They had slept in a guesthouse in Ghiling the previous night; we would see them again the next morning at Ghar Gompa above Tsarang. 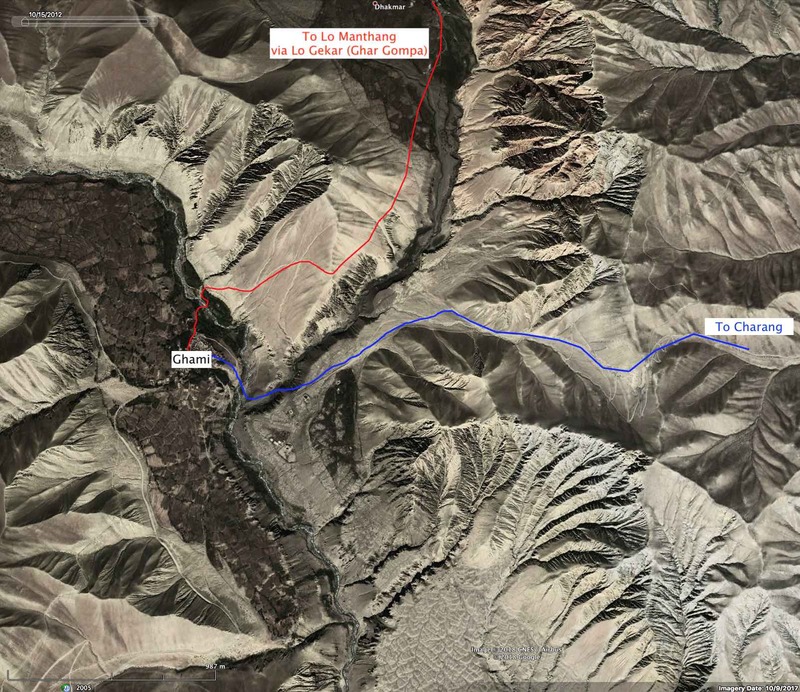 The map and the following images show the easy downhill walk to Ghami from the pass, mostly on the jeep road. Already visible as we walked down was the next pass. Tsarang La (3870), which would take us down to Tsarang in the early afternoon. At a minimum of $500. U.S. per visitor for ten days, where does that money go? Maybe it pays for the road to China? 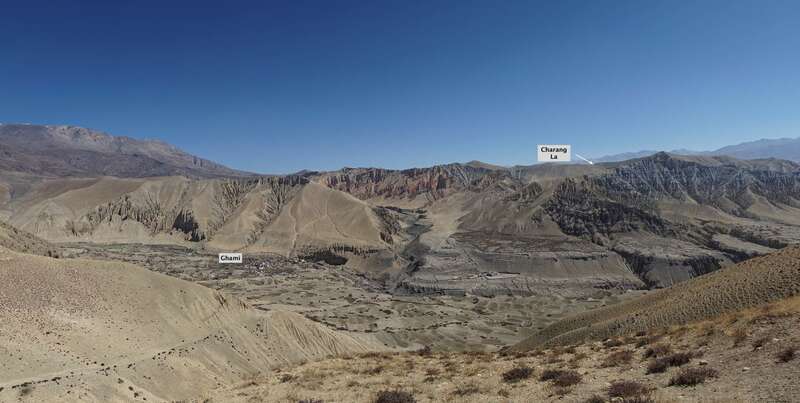 Increased vehicle traffic will end upper Mustang as a trekking destination but will make travel and transport of food and goods much easier and cheaper for the 6000 to 7000 who still live there. But first Ghami. 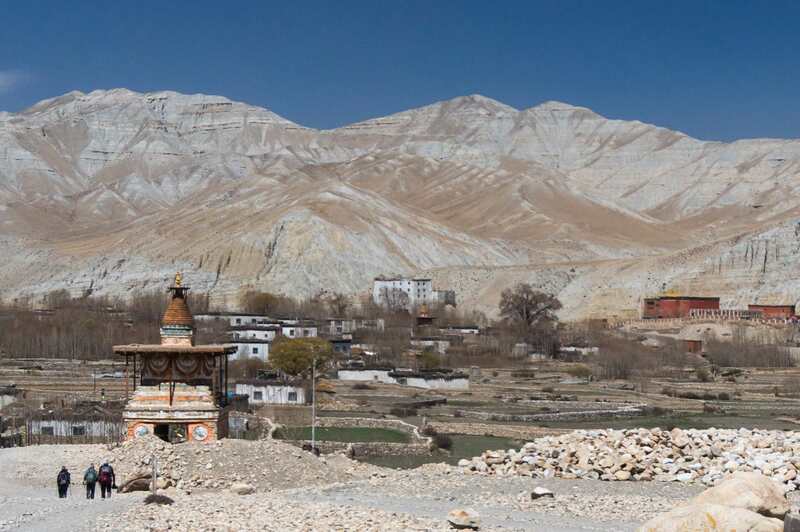 After Lo Manthang and Charang, it is the largest village in upper Mustang. 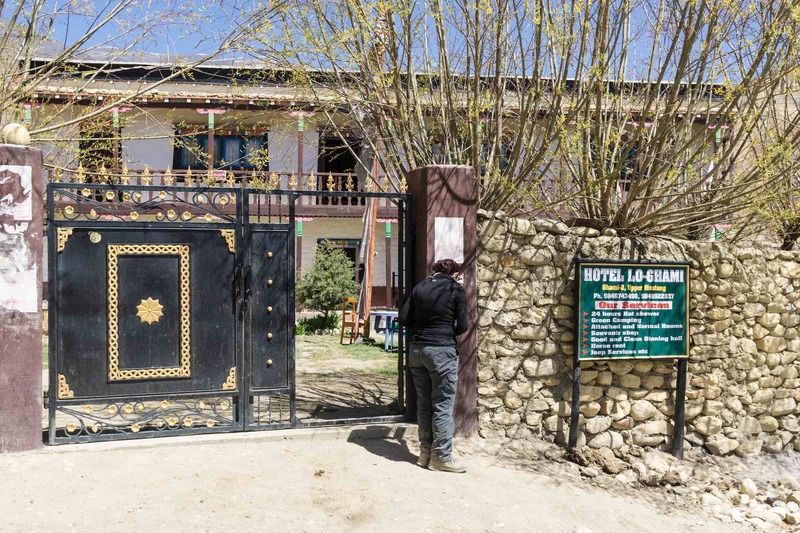 We stopped at the first guesthouse – Hotel Lo-Ghami – on the south end of the village and entered the grounds through the gate pictured in the image below. Home on school break from her Kathmandu boarding school was the owners’ daughter and we spoke briefly about the coming high season and how they hoped the number of overnight guests would increase as it got closer to the annual Tiji Festival in Lo Manthang, still a couple of weeks away. After lunch, we did not spend any time in the village but headed to the south end and crossed a small stream. 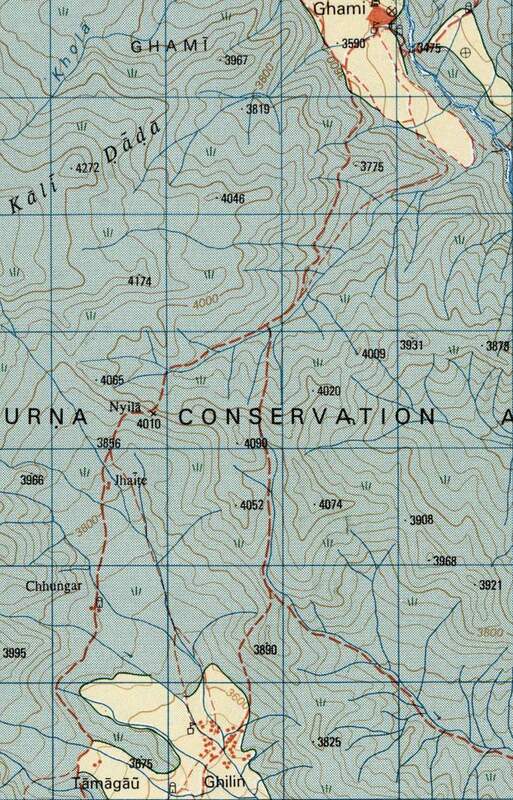 Meanwhile, we walked the route marked in blue past the district’s (and maybe Nepal’s!) longest mani wall. The wall goes on for a couple of hundred meters and we followed it all the way to the top as we made our way to Charang La. Behind the mani wall are a number of buildings, including a Japanese-built (and paid for) hospital. 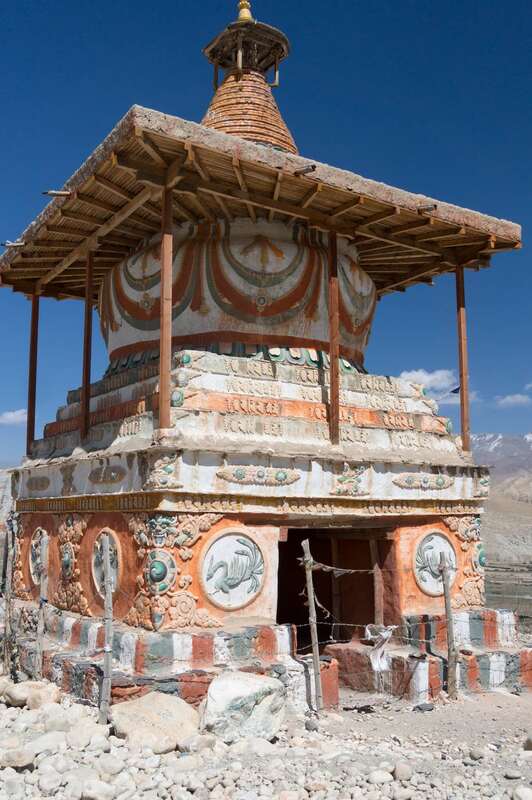 It is one of the few such facilities in upper Mustang. Given the U.S $1,000,000. 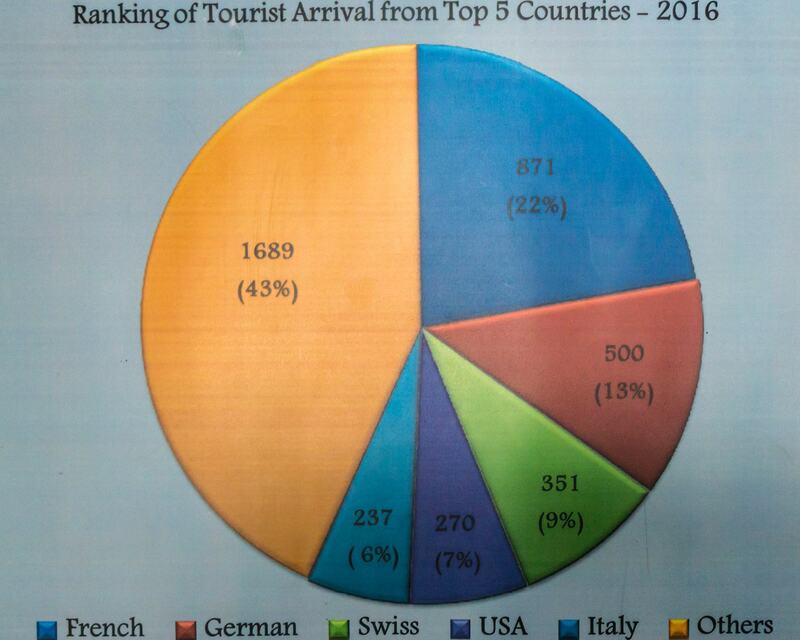 (and more) that the government takes in from entry permits each year from the 2000 to 3000 non-Nepali visitors, you have to wonder where that money ends up. From Nyi La in the morning, I had taken a shot of the eye-catching red and grey rock to the east of Ghami. Also discernible in the image below is the long mani wall as it runs diagonally to the left of some of the buildings you see. The Japanese hospital is one of those buildings but as we walked by the wall I never did get a view of it. 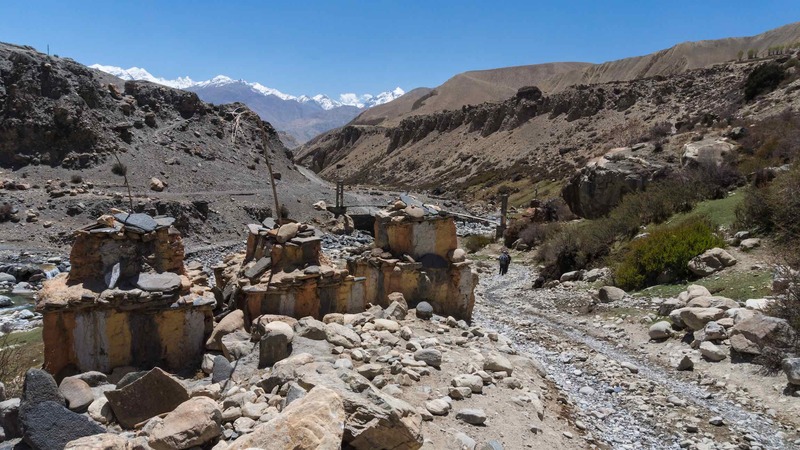 the trail east of Ghami to Charang La – the photo was taken from the pass south of Ghami in the morning! 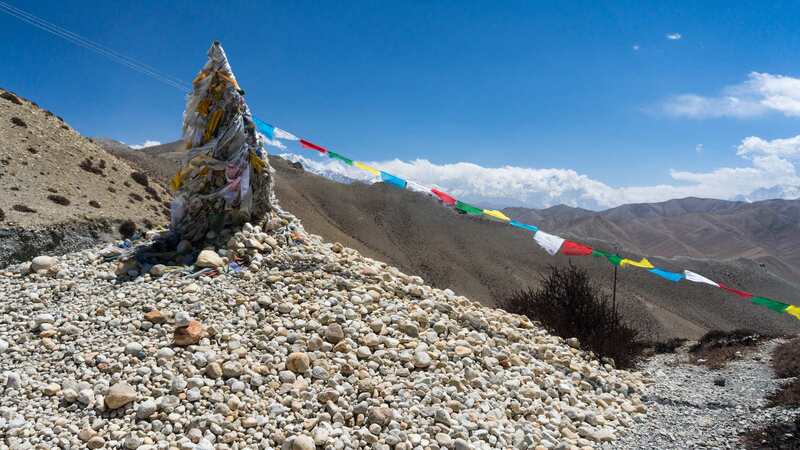 We spent a bit of time at the top of the pass, sipping on water, getting a few photos, and adding our light-coloured rock to the impressive collection around the pole draped with prayer flags and khatas. 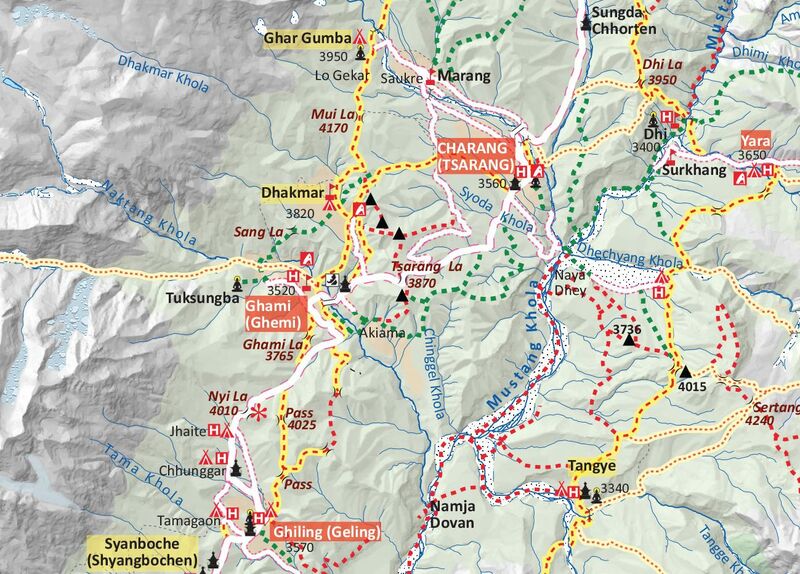 Down below – about 4.5 kilometers away – was Tsarang (3560 m), where we would be tenting for the next two nights. An easy walk, mostly on the road, and we were approaching the entrance chorten to the village. 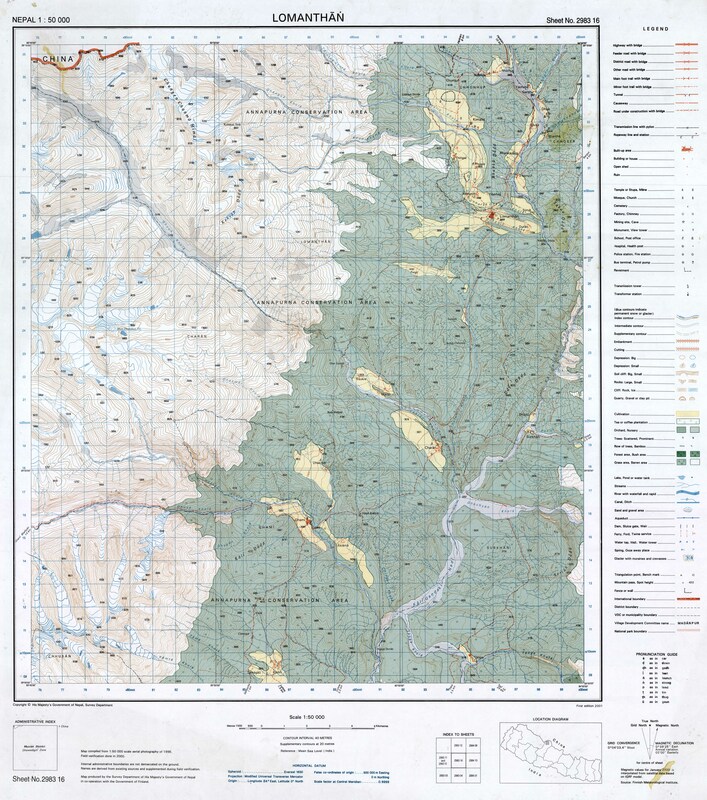 the road from Charang La to Charang – 4.5 km. 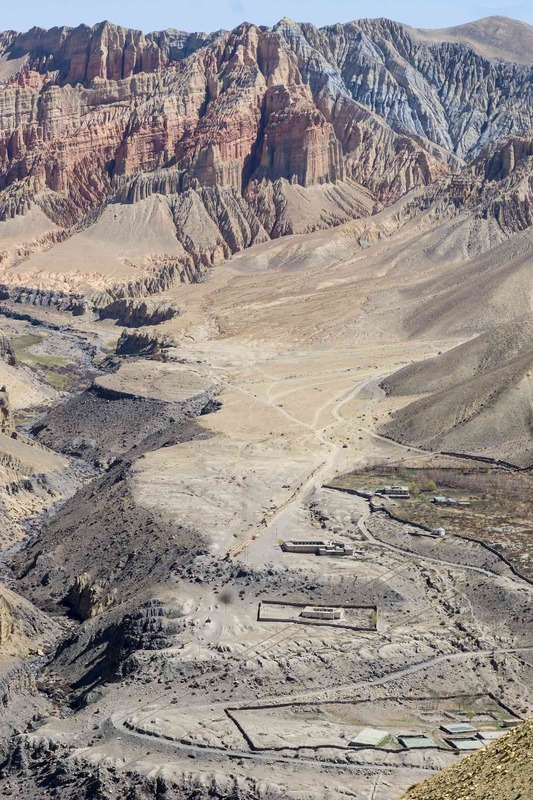 From a distance, the two most prominent buildings in Tsarang were already evident – the white-painted dzong/royal palace and the rust-coloured monastery complex. Our destination was Maya’s Inn, located not far from the two buildings. After our tents had been set up in the campground attached to the inn, we would visit the landmarks. 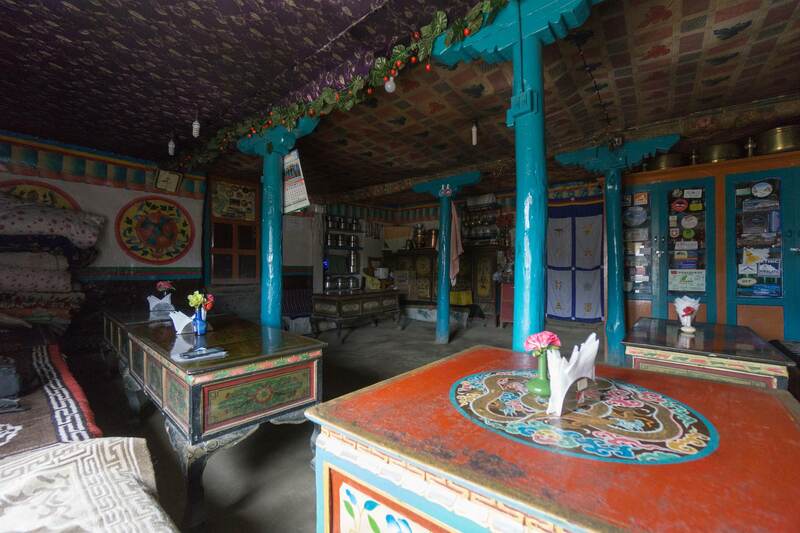 Maya’s Inn – Tsarang’s #1 place to stay! 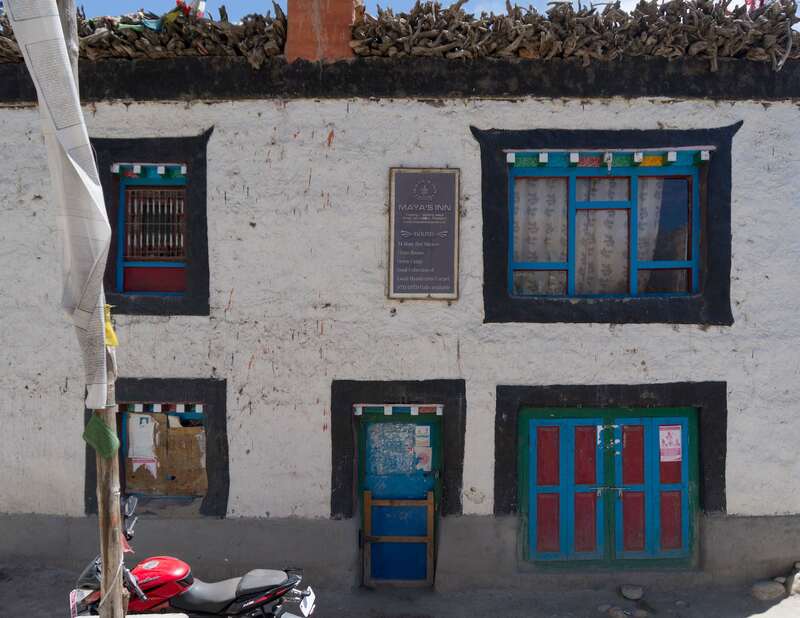 Maya’s Inn belongs to the former king’s niece, Maya Bista. 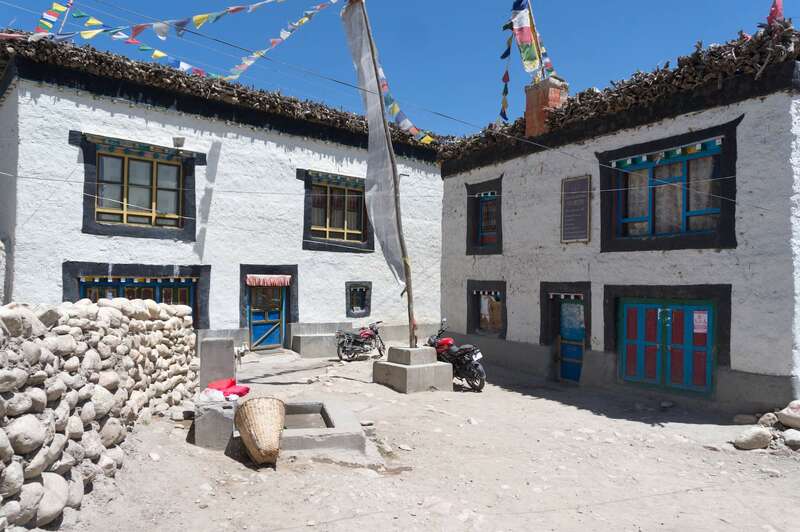 Considered Tsarang’s #1 guesthouse, it will hold on to its ranking at least until the massive multi-storeyed new hotel nearby currently under construction opens in a year or two. The internet connection I made here would be the last until Koto a couple of weeks later! 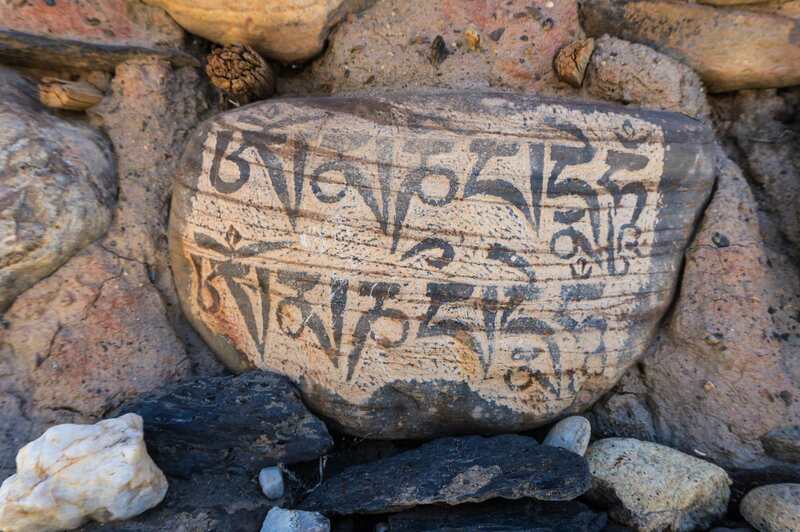 This entry was posted in hiking/trekking, Nepal and tagged Charang chorten, Ghami japanese hospital, Ghami mani wall, Ghami upper mustang, Nyi La, tamagaon trek, Tsarang, upper mustang annual permit number, upper mustang trekker nationality. Bookmark the permalink.